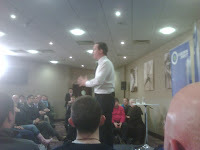 Last night I attended Cameron Direct with Mark Reckons who has done a blog on the event here. I agree with Mark that it was good to see the possible future Prime Minister up close. David Cameron is an excellent performer live, this is his 157th Cameron Direct. Although there is a Blair feeling about him when you see him live. I can also see him doing very well in the leader debate. What bothered me about this event was that it did have enough swing voters there. Infact most of the audience were those in politics (there were two Lib Dems sitting behind me and many members of the Reading Conservatives) or those from the volunteer sector who wanted to know that their sector would still be funded under the Conservatives. This was not a big room and the event was much smaller than I expected. I would guess that there was just over 100 people. This was reflected in the questions, which were quite frankly too easy and not questions ordinary members of the public would of asked. Many questions were on the third sector and one was even on his video shoot with Carol Vorderman about improving numeracy. There was no questions on expenses, immigration, benefits, the EU, Gay Marriage. Some very hot topics just not covered. If the public don't ask then the politicians are not going to concern themselves as much with these subjects. I didn't get to ask my question as we ran out of time and most people did have a question for David Cameron. I wanted to ask if Andrew Mackay will ever have to pay any funds back for the second home scandle and refer to the fact that I'm in a safe seat in Bracknell (unlike Reading East or West). Therefore what is the point in voting for the Tories or any other party if it's the Tories who will get in anyway. How can I express my vote for my dissatisfaction with the Andrew Mackay second home scandal. I wanted to know what he would of suggested. Anyway in sum up I think he does mean well and is standing for the right reasons and I hope he does do a good job with or without a Hung Parliament. "I wanted to know what he would of suggested"
I guess he would have gone off on a tangent about their wonderful open primary and the wonderful candidate they have selected who is a GP, all round good egg etc etc. The Conservatives claimed that everyone there was from Reading West constituency. I guess they were fibbing. As readers may or may not be aware the event was a reschedule on an event canceled due to snow the week prior. The original event was due to be Health & NHS specific, and had people from across the greater Reading area who were interested in this topic. All those allocated tickets to the first event were given first refusal on the rescheduled event, this included many from the Voluntary sector. The next priority for ticket was given to Reading West residents. One person there applied on the day let they asked for my address to check were I was from. Some how I dont think they were worried if I wasnt from Reading West After all Mark Reckons and I were both from Bracknell. Thanks paul for the explaination re the tickets I now understand why there were some many third sector members there. After the antics of Andrew Mackay whose name will forever be enshrined as the biggest expenses cheat in all Parliament - and that is saying something why is everyone so confident that Bracknell is such a safe Tory safe seat? Because it still appears to be the case from local elections and the majority is so so high. Some people will always vote for the same party no matter what.